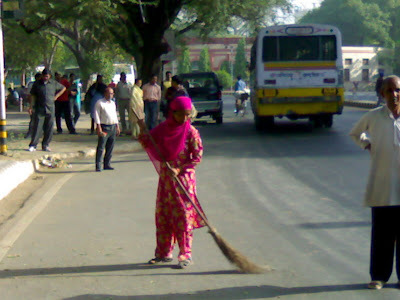 This post is dedicated to this unknown face who I see cleaning the roads of Delhi everyday. Will talk to her one of these days. I am fascinated with the strong confident strokes of the broom that this petite lady has mastered. They remind me of the confident brush strokes of famous painters. i see similar people doing the same job in my country. but its like everyday we pass by them, little acknowledging their existence.